Welcome to the Dunbar Lifeboat section of Lost Dunbar. There has been a Lifeboat stationed in Dunbar for over 200 years and this section is dedicated to the courageous men and women who have risked their own lives to save those of others. The Dunbar Lifeboat has been involved in hundreds of rescues and has saved countless lives. This section of Lost Dunbar will hopefully give a brief insight into the history of the Dunbar Lifeboat and illustrate the bravery of the number of crews which have manned the lifeboat over the years. 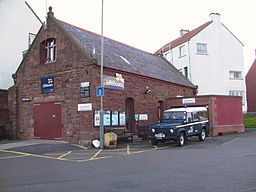 Or visit the Dunbar Lifeboat Shop which is located at the Dunbar Lifeboat Station, Victoria Harbour Dunbar. Opening times vary throughout the year.